Why measure women’s empowerment? What, broadly, has the Strategic Impact Inquiry on women’s empowerment taught us to date? 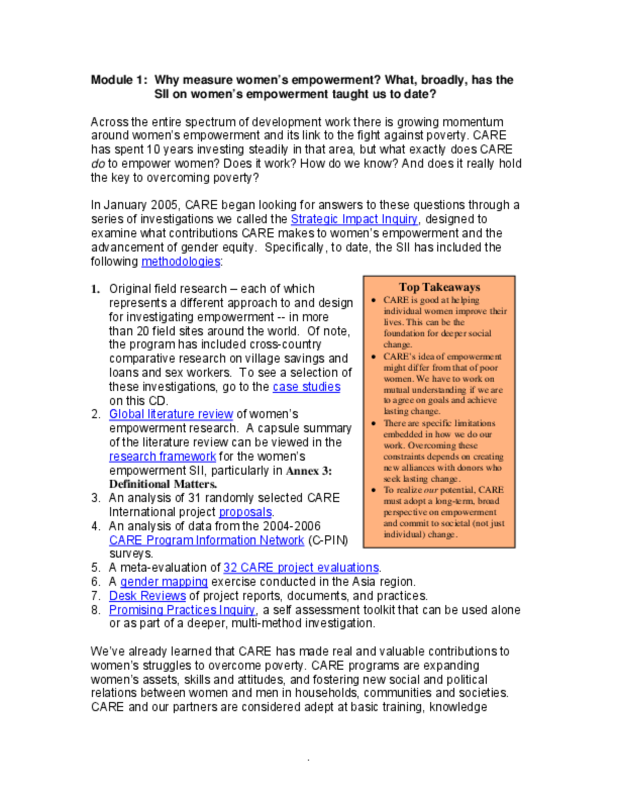 CARE has made real and valuable contributions to women's struggles to overcome poverty. Women have said that the skills and confidence they had gained from contact with CARE programs were allowing them to play a stronger and more active role in the household, to talk with their husbands at a more equal level, to participate in public meetings and to enter the public sphere more broadly. All of the projects studied fall somewhere along a continuum of good to great gender work. CARE helps communities tackle the deeply embedded structures that perpetuate poverty and injustice, even though it means the organization will encounter new tensions and risks. Changing the systems that oppress women is crucial to overcoming poverty.